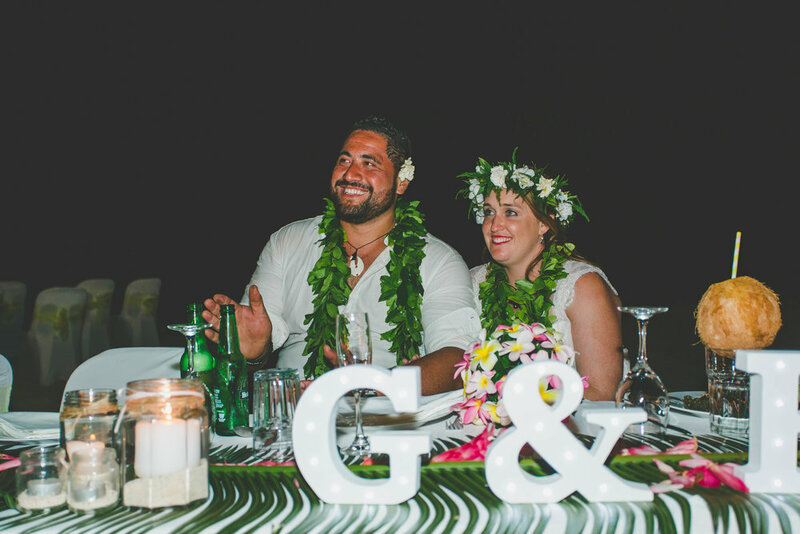 Giddy and I first met in the summer of 2012 on the dance floor at Staircase bar. 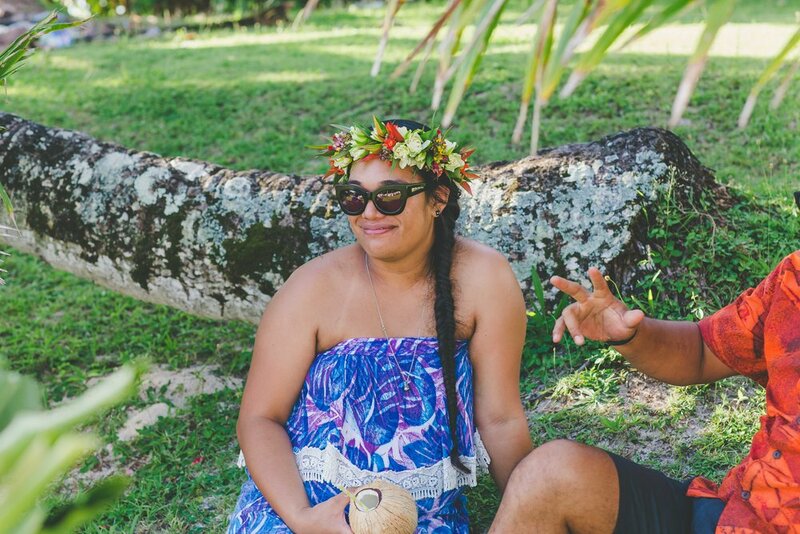 I had been working at a local resort and he was on a one month holiday with his Rarotongan family. 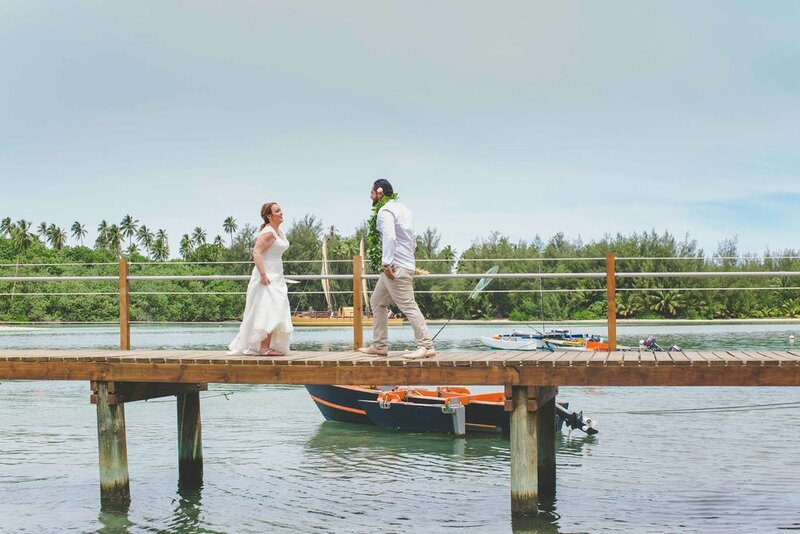 This was just the beginning of our adventure together. 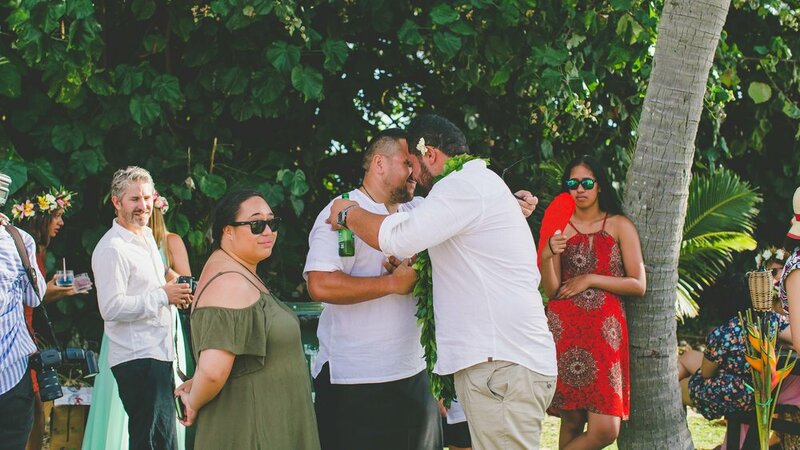 On my birthday last year, Giddy surprised me in the most romantic way by proposing over fish n chips on the beach in front of my childhood home in Urenui, Taranaki. 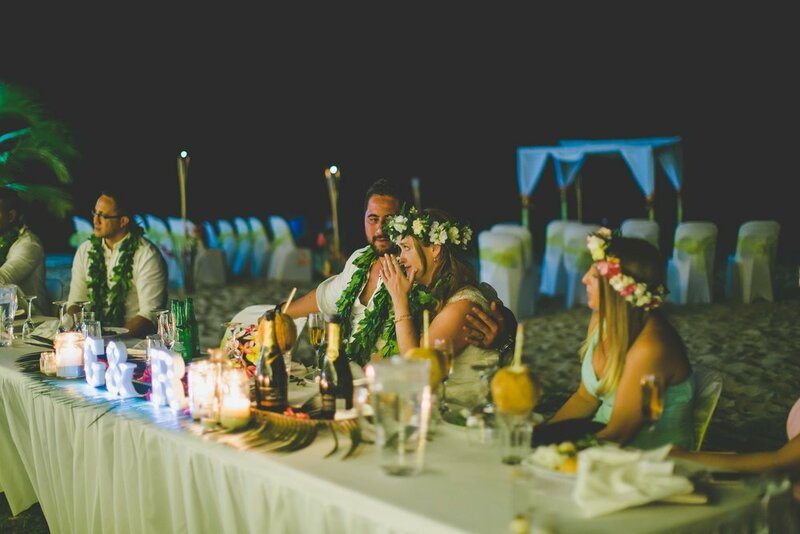 When discussing where to get married it didn't take long for us to decide on the location…. 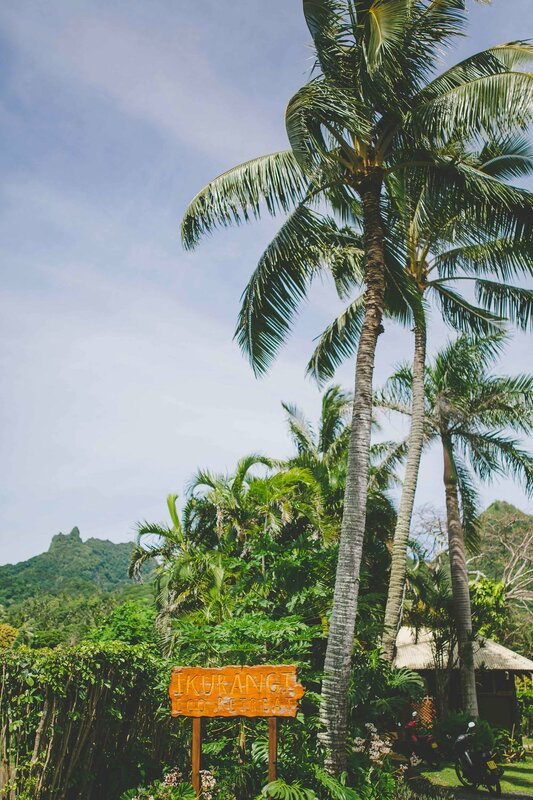 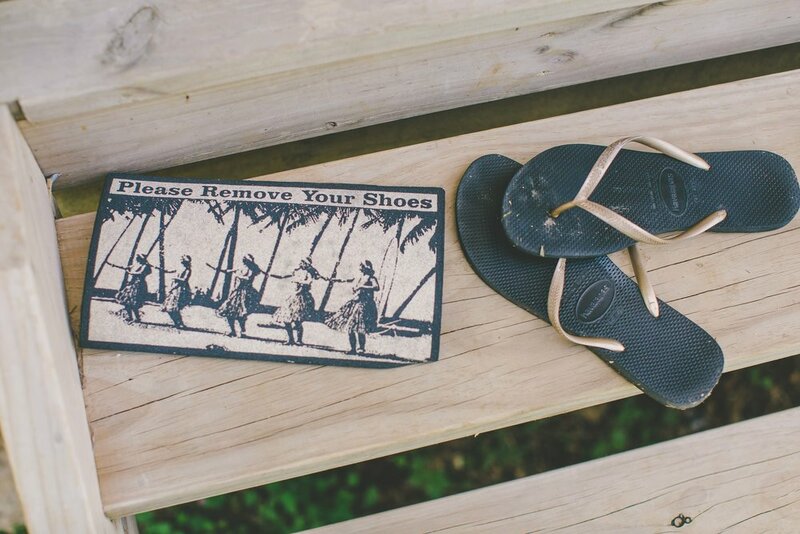 it has to be Rarotonga. 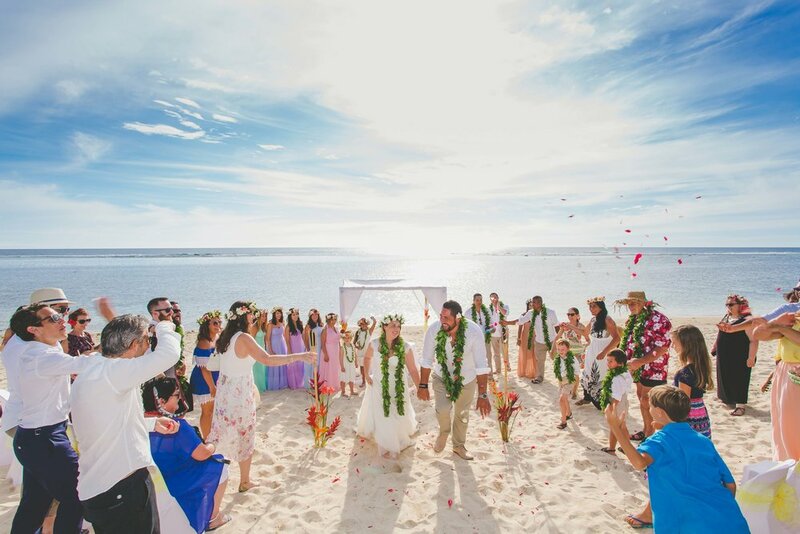 After all that is where it all began..
Our wedding couldn't have been more perfect. 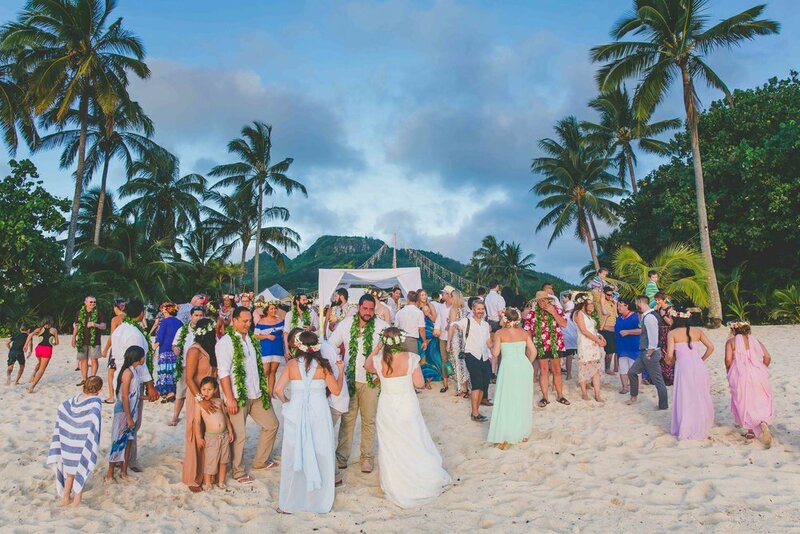 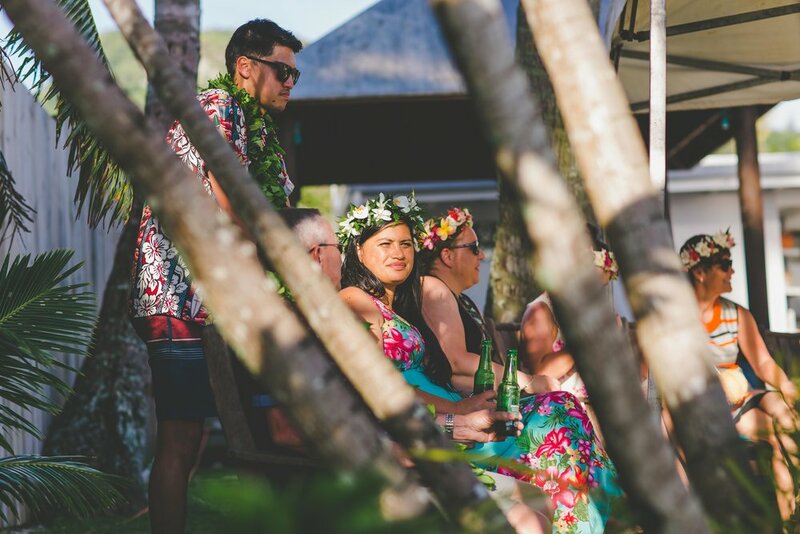 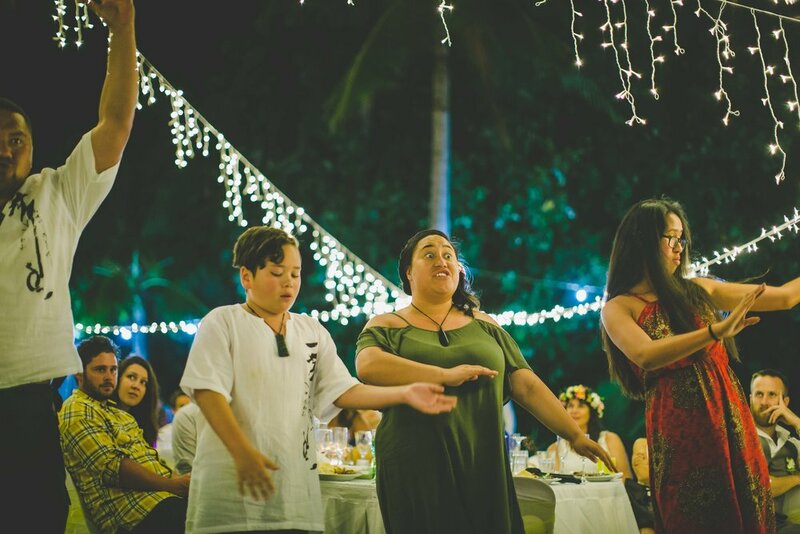 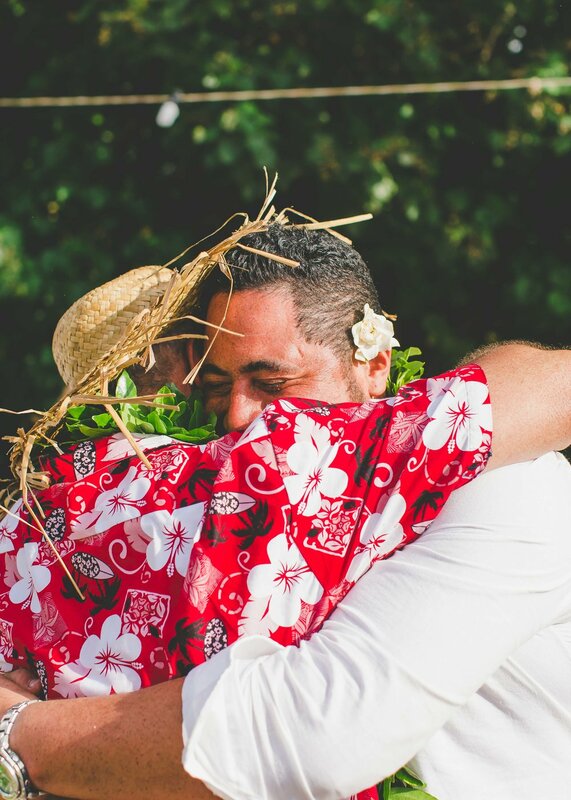 Over 70 friends and family flew in from different parts of the world to celebrate with us, along with our whanau already living in the Cook Islands. 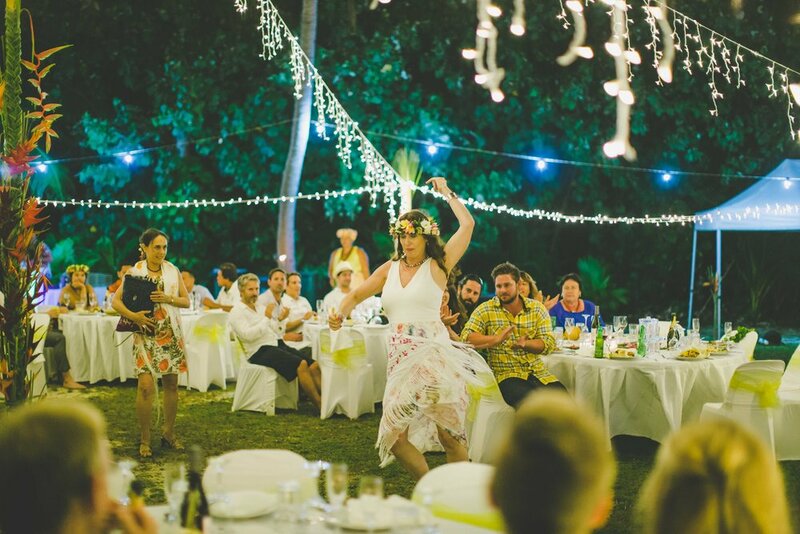 What we loved the most was rather than just one - wedding day we had a weeklong wedding celebration. 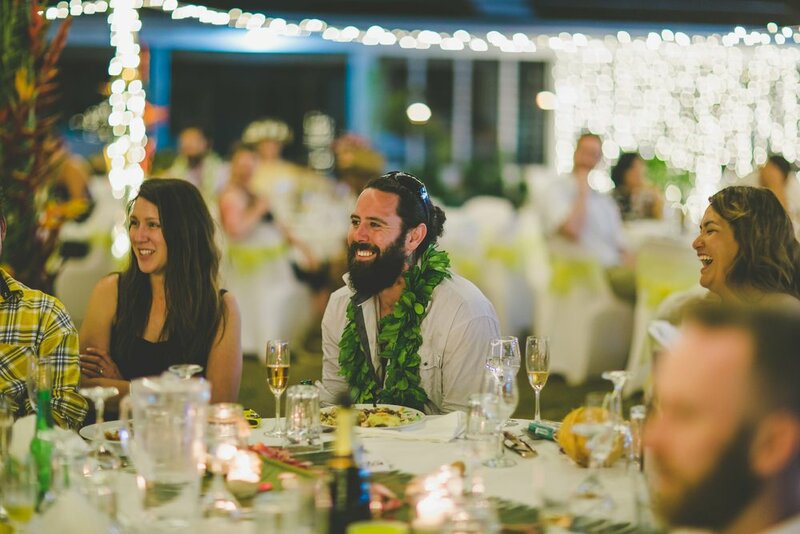 As you can imagine we had a blast! 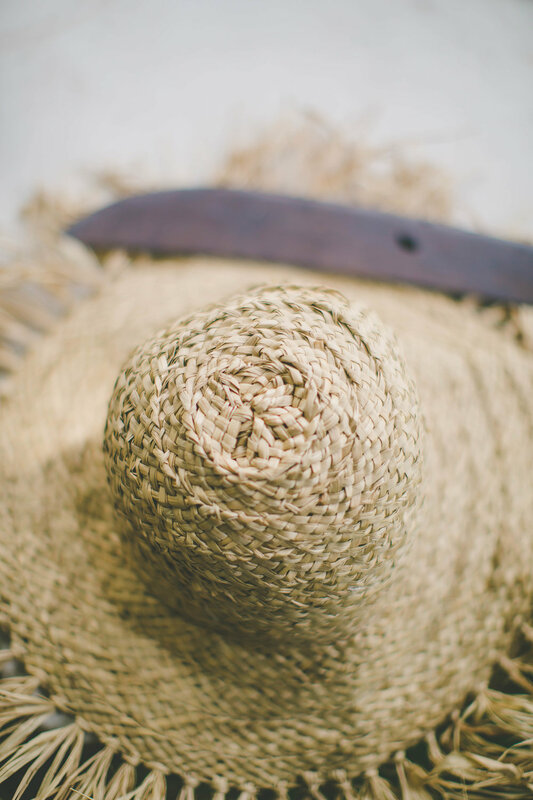 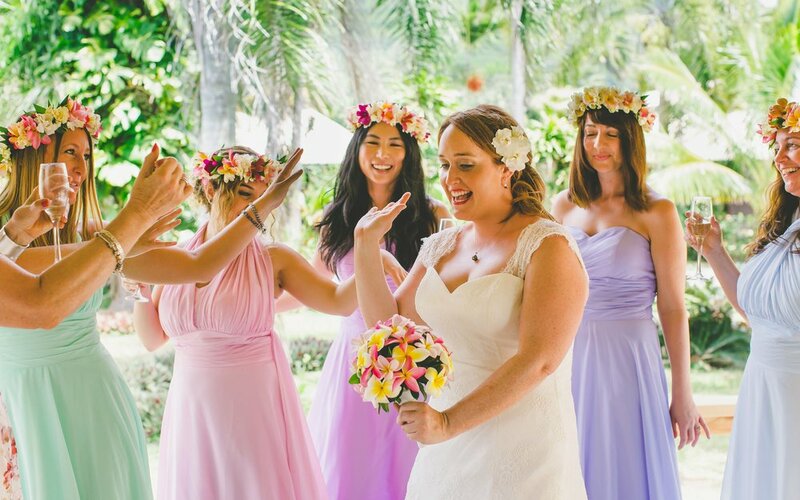 On our wedding day, we followed tradition by getting ready separately. 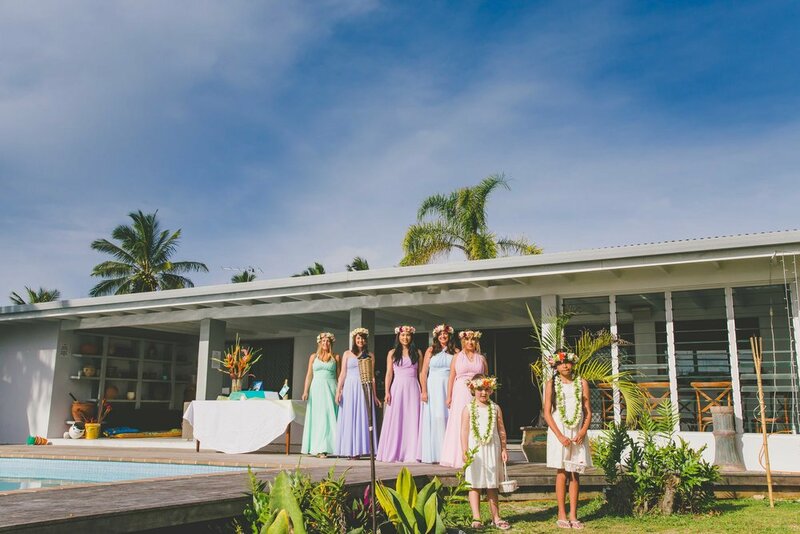 Mum, my five bridesmaids and I got ready at Ikurangi; a gorgeous eco glamping retreat. 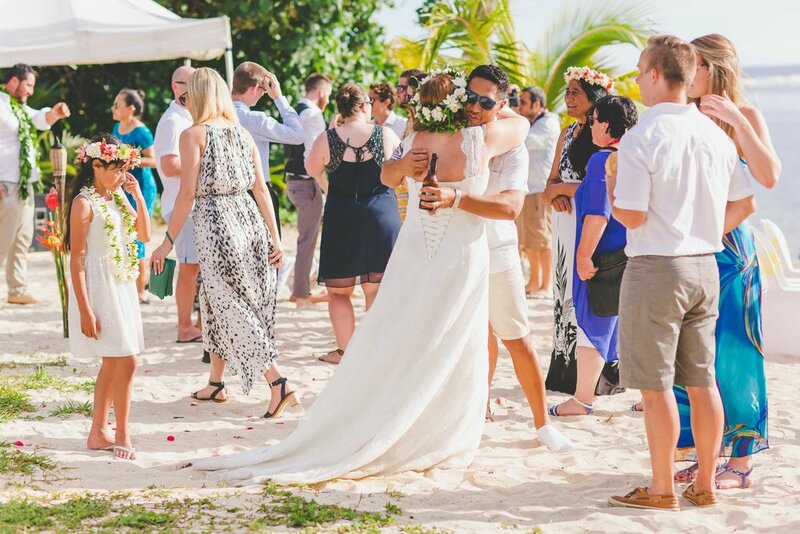 We drank champagne, laughed and danced salsa. 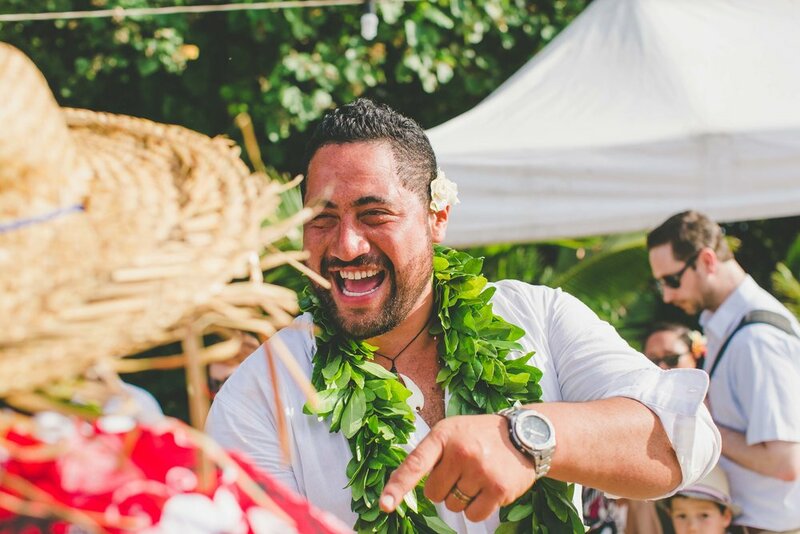 Giddy got ready at his family home in Turangi; a sentimental place for him. 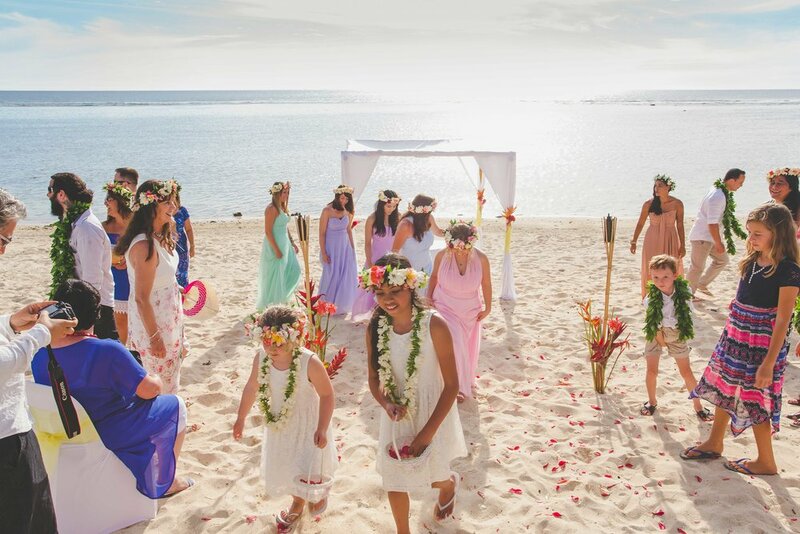 To get the most out of our day - we decided to get our photos taken as a couple prior to the wedding. 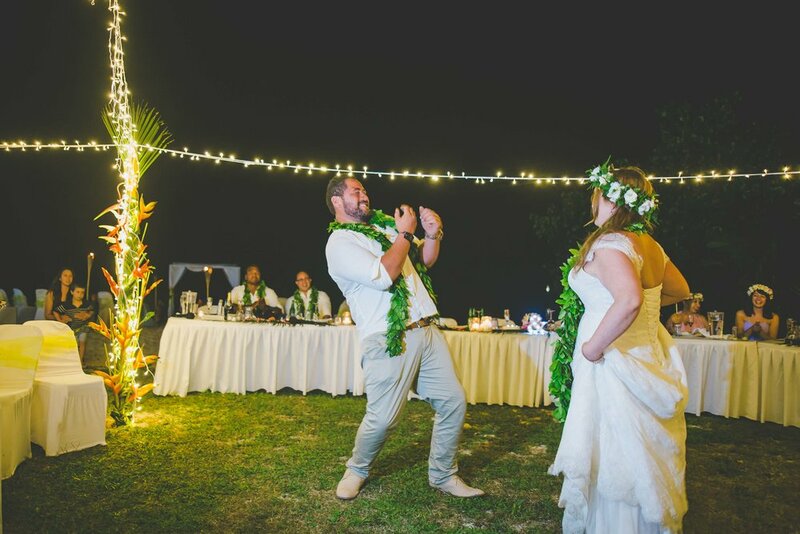 This was the best decision as that way we could get into the festivities with our guests following the ceremony. 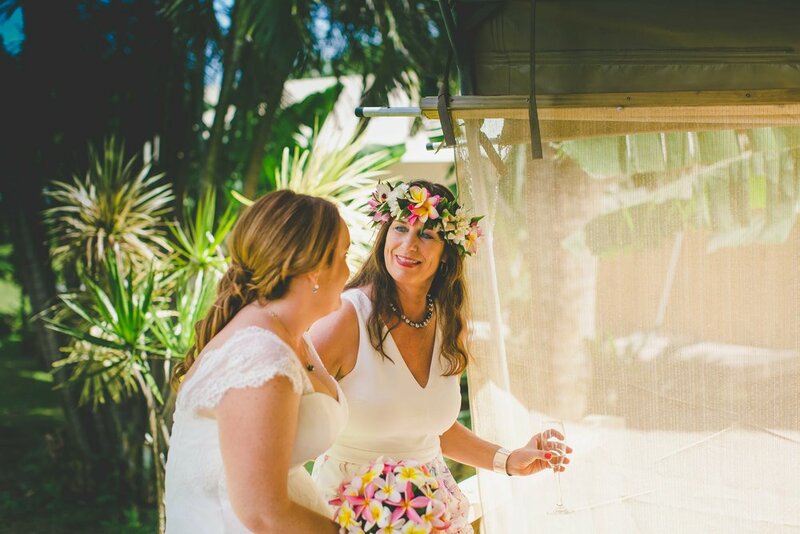 Melanie Cooper ensured the day ran seamlessly and we had a great time. 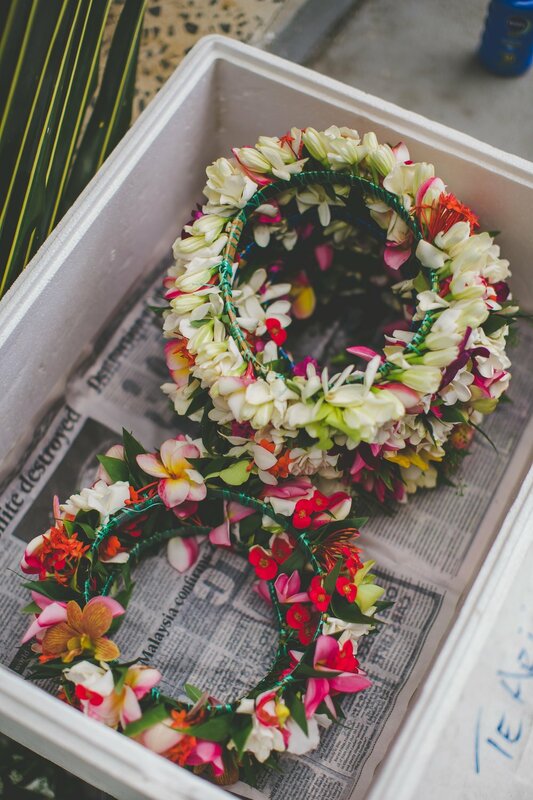 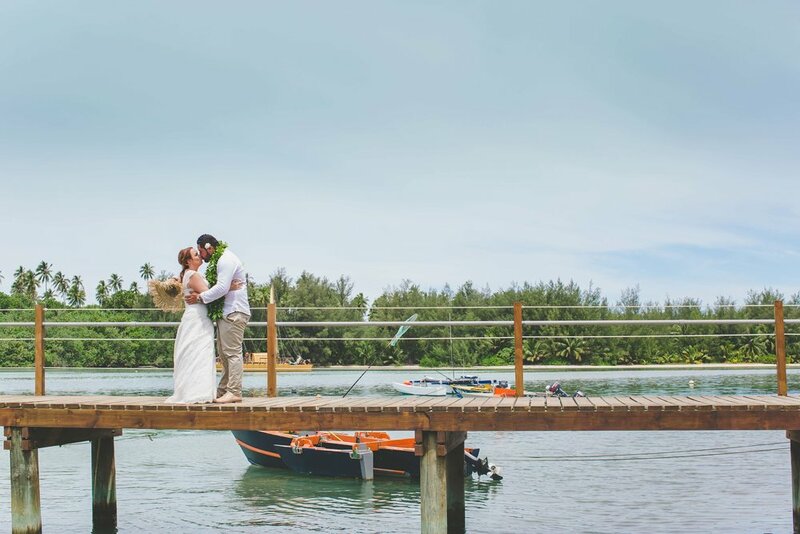 From our ‘first look’ moment on Avana pier, to organising a boat trip out to an uninhibited island, to driving us around our island home to capture different locations that were particularly meaningful to us. 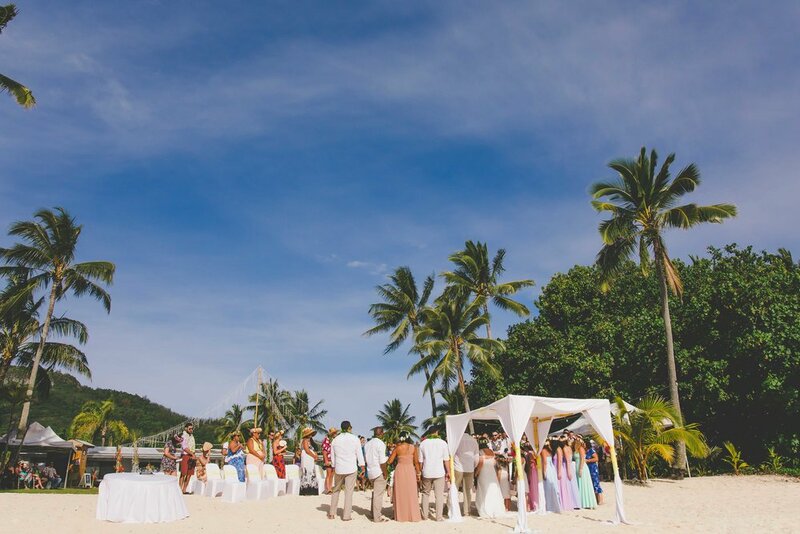 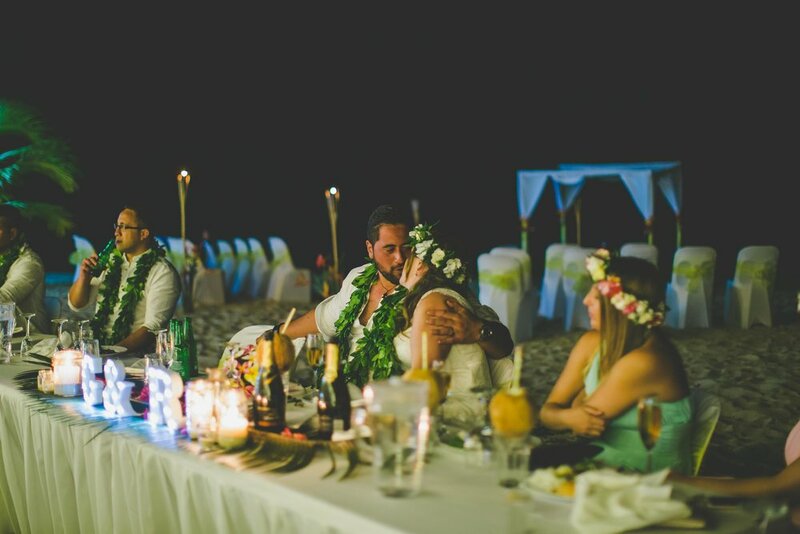 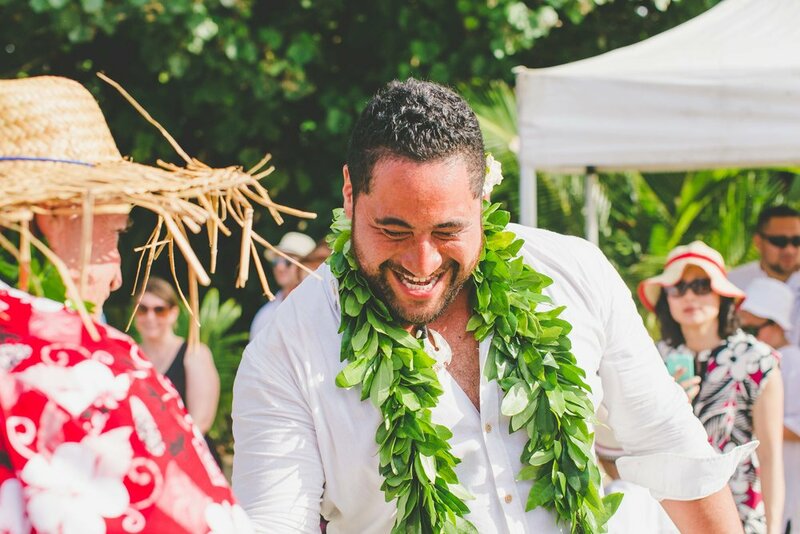 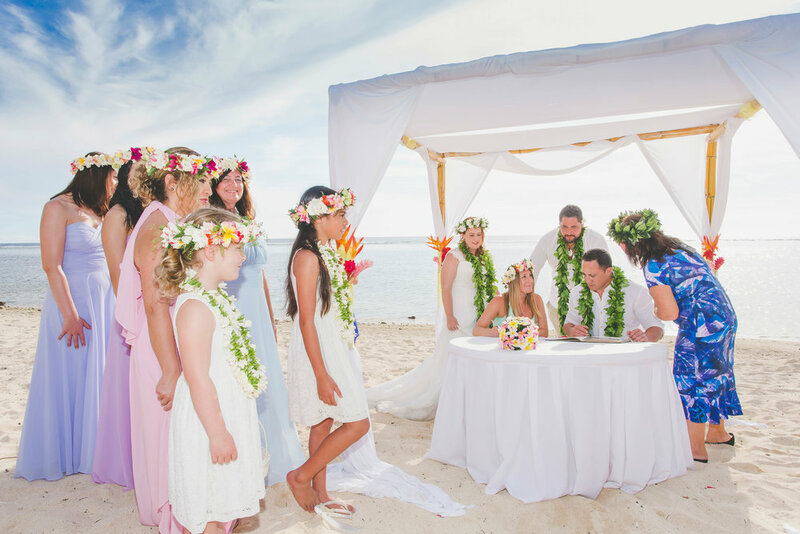 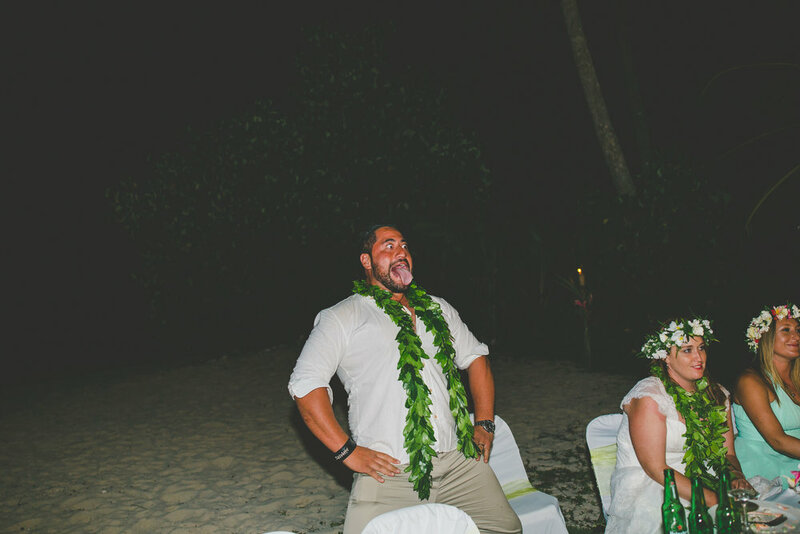 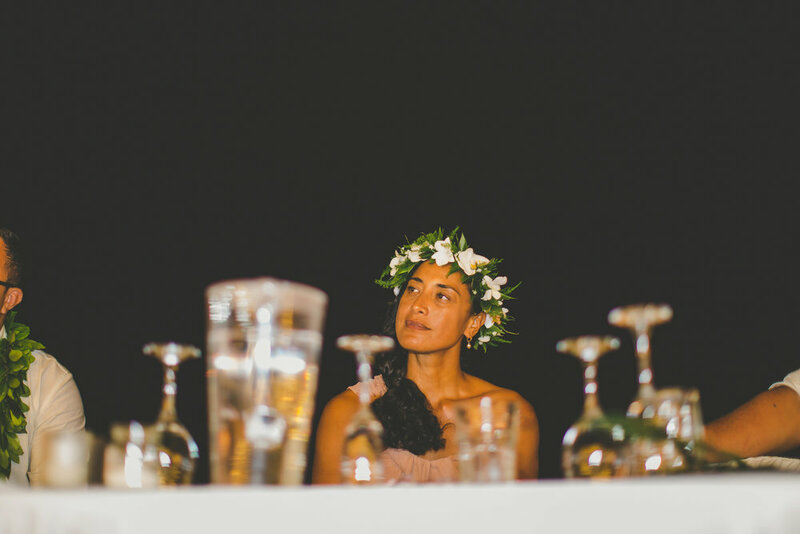 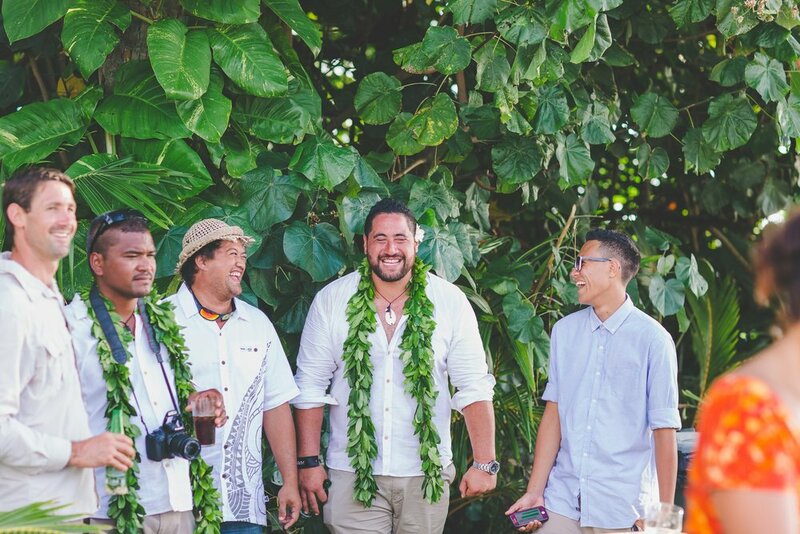 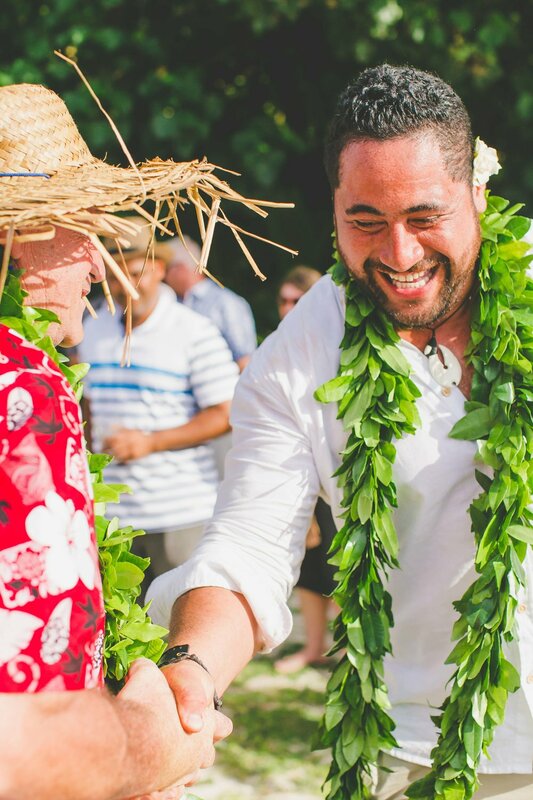 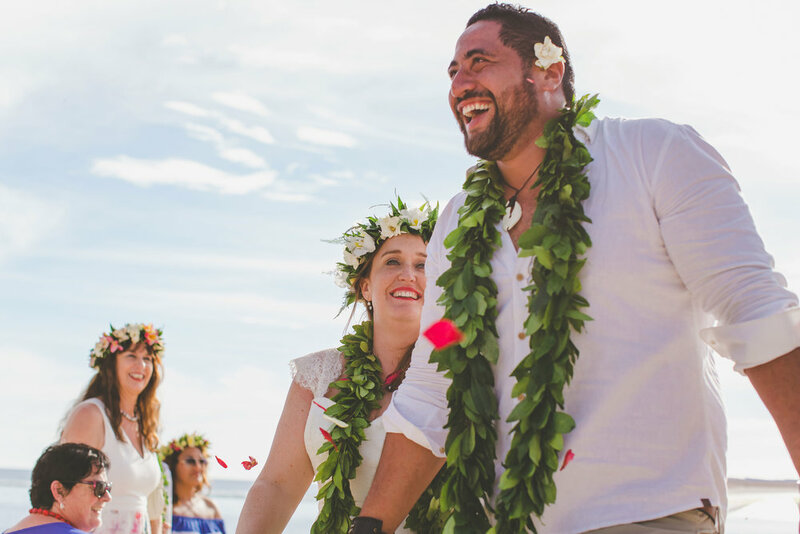 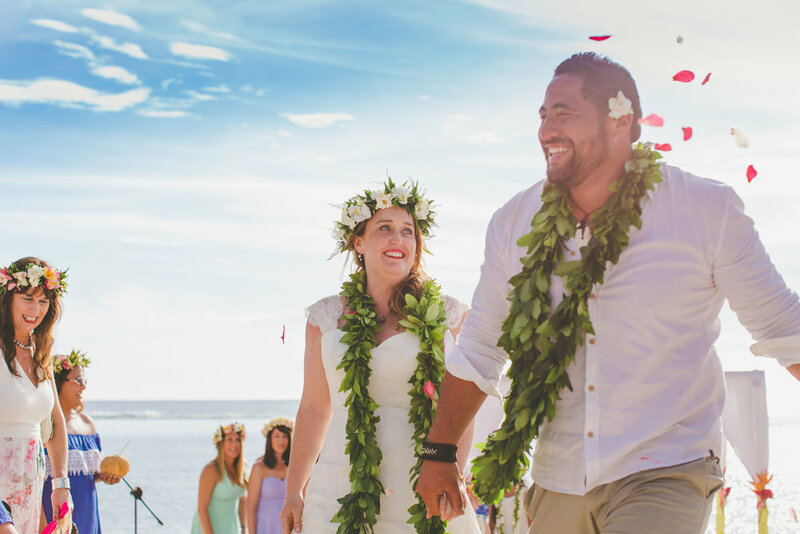 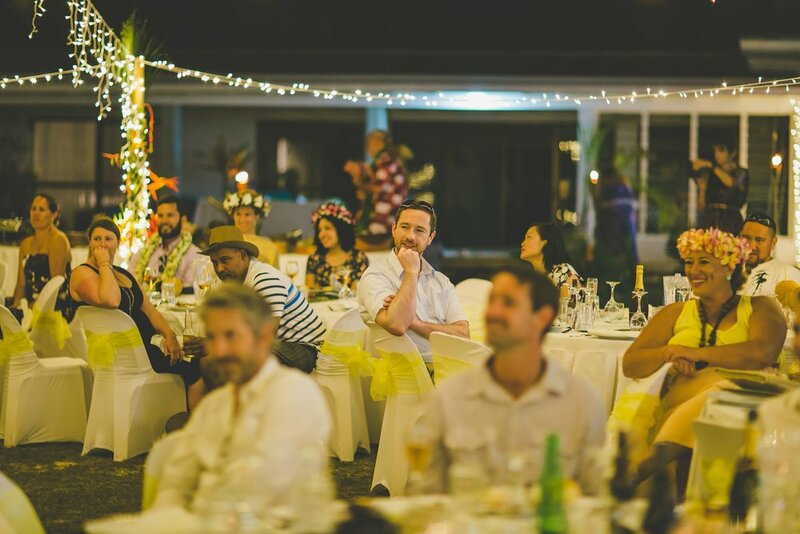 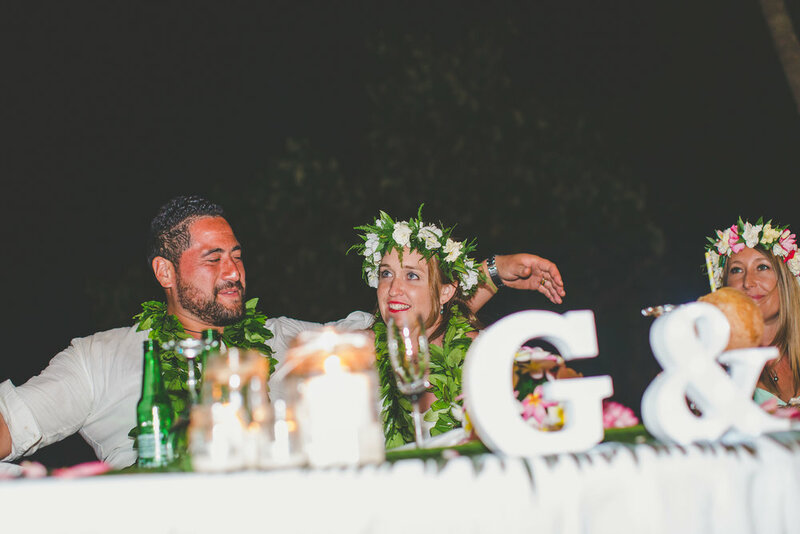 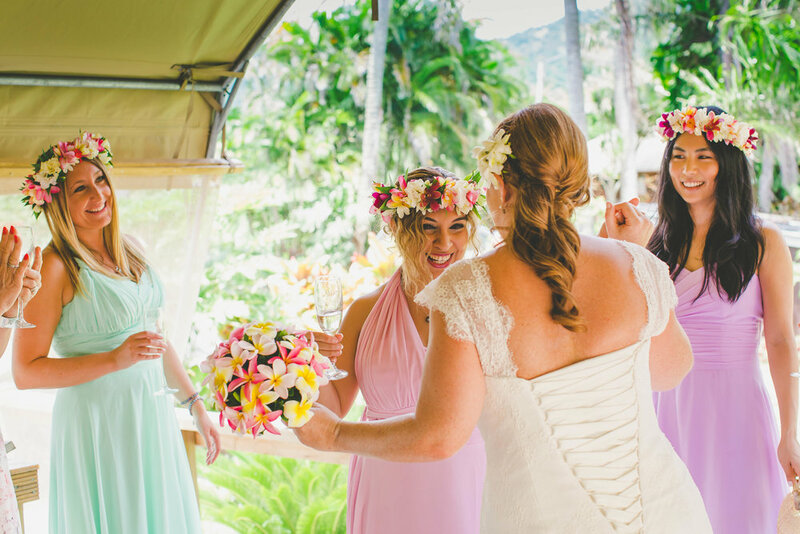 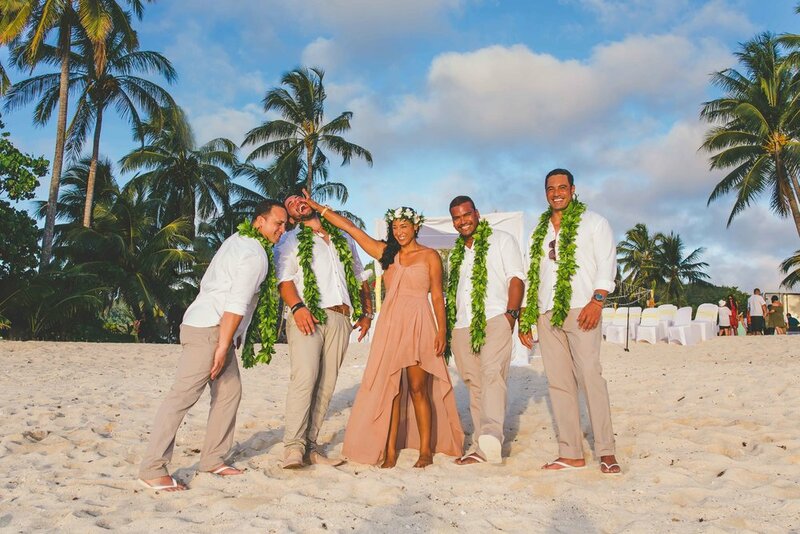 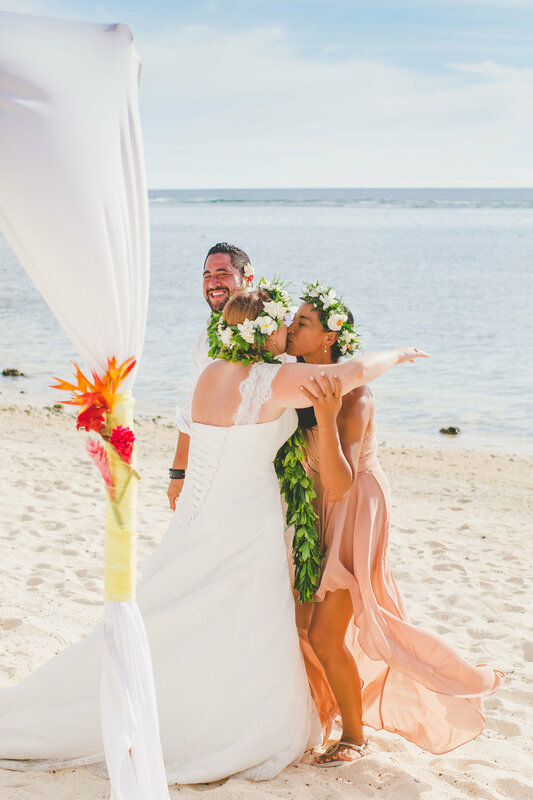 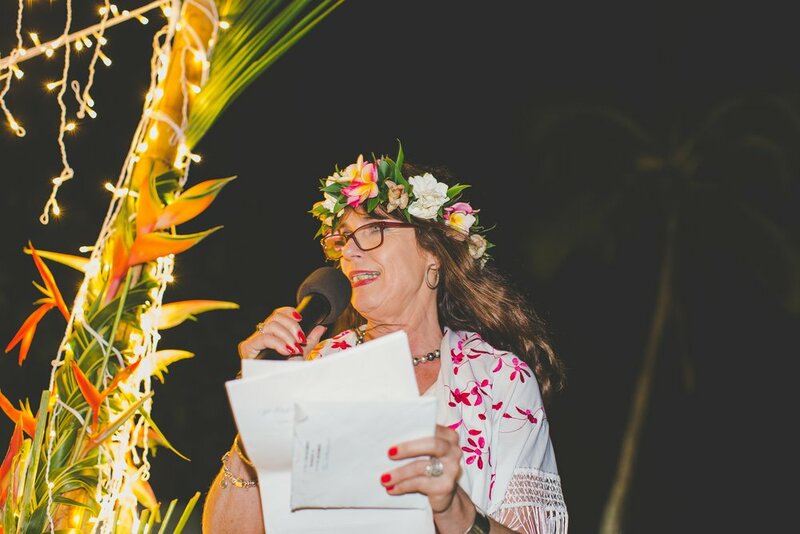 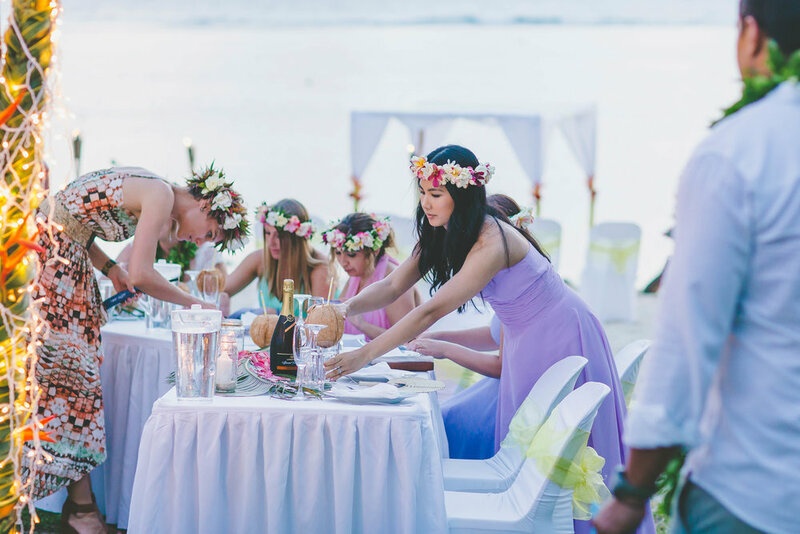 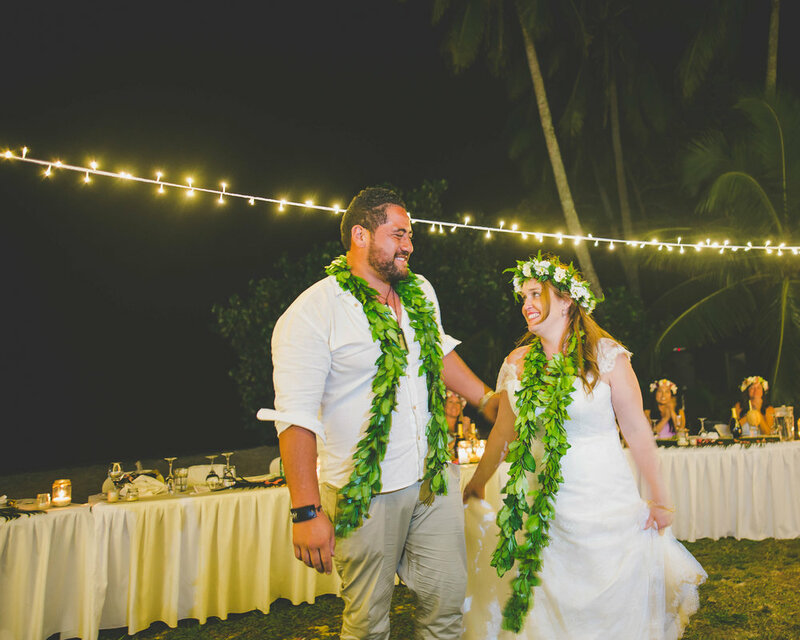 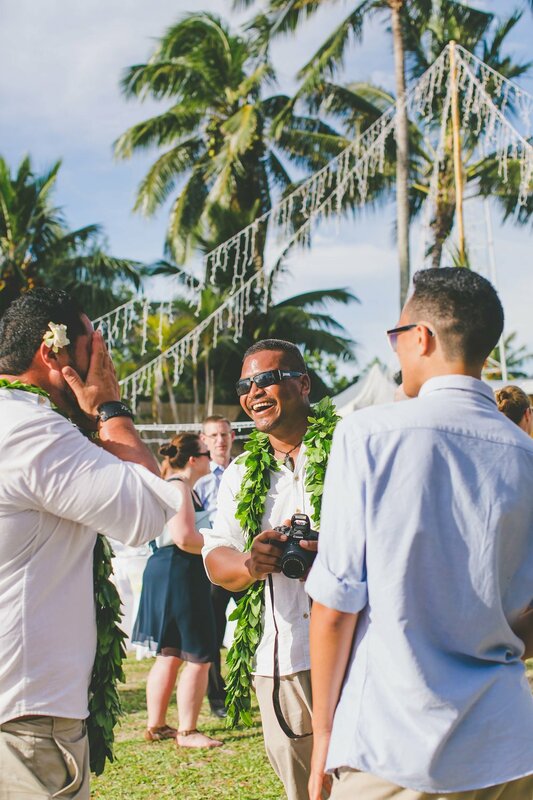 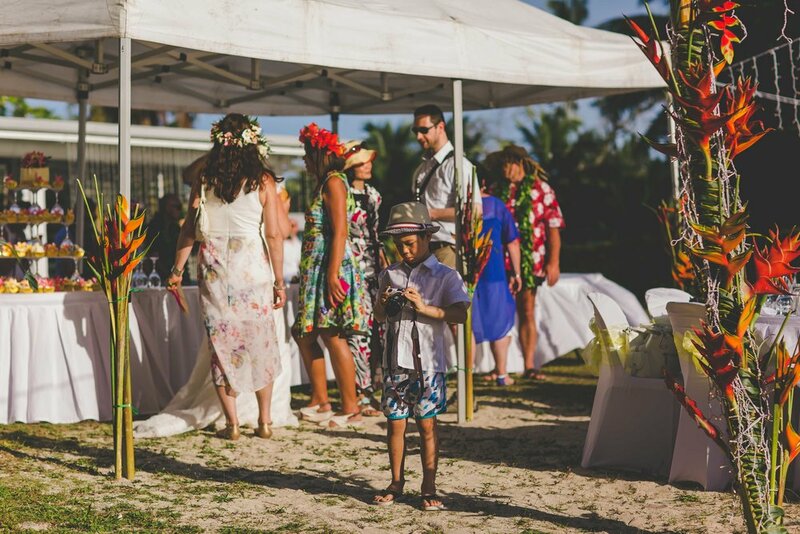 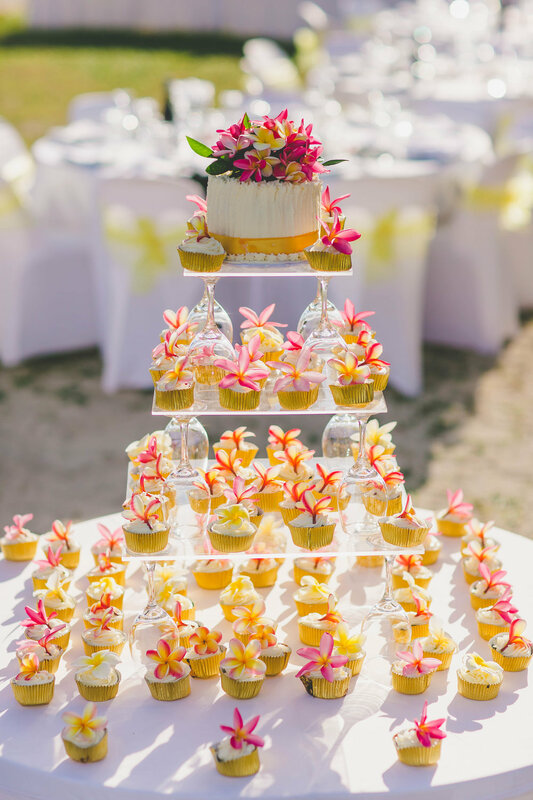 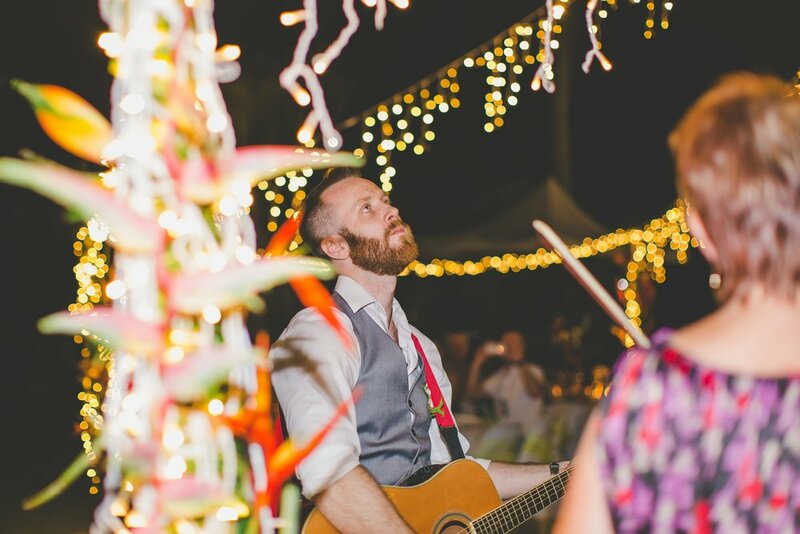 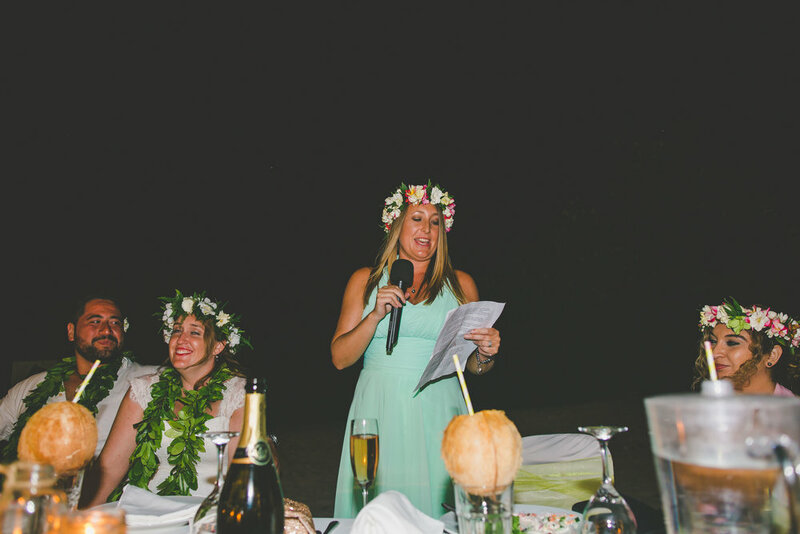 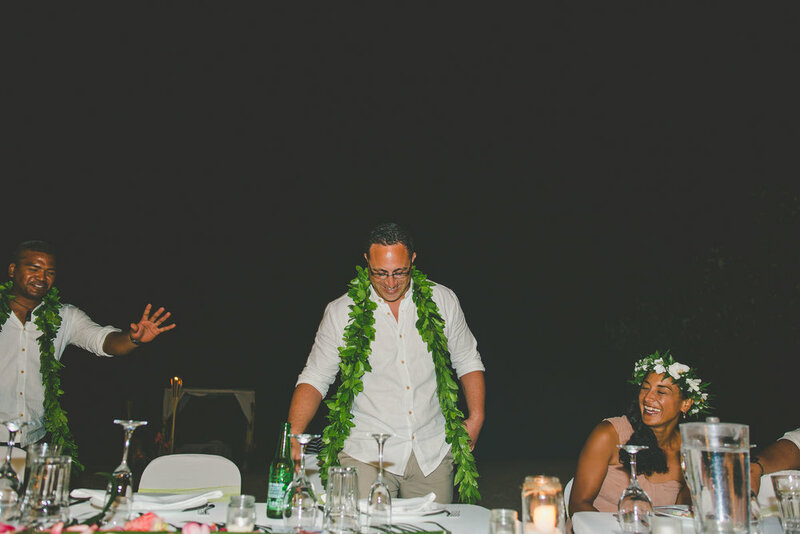 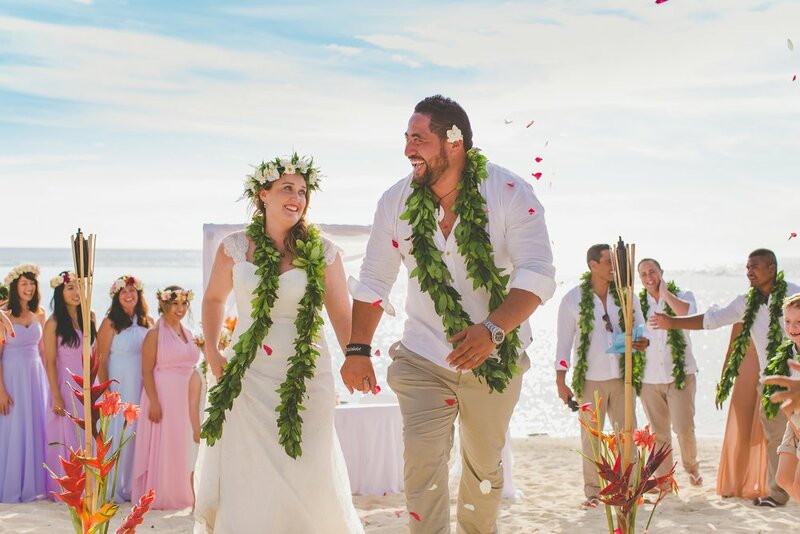 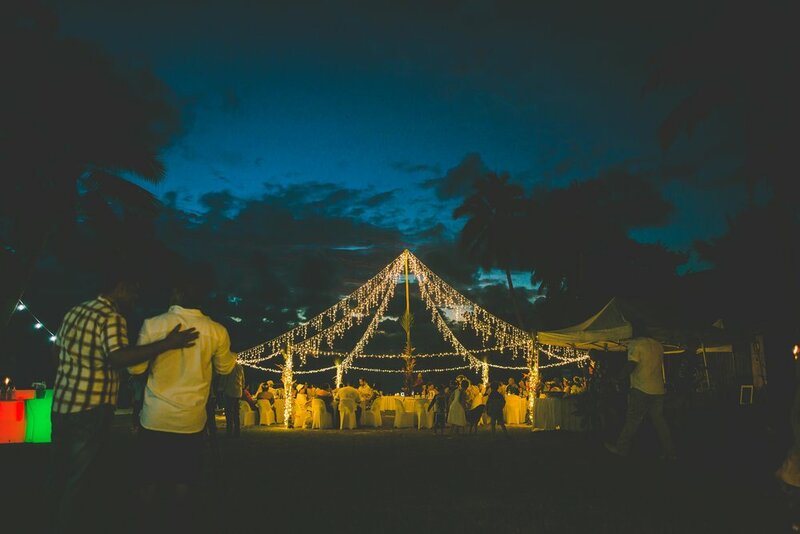 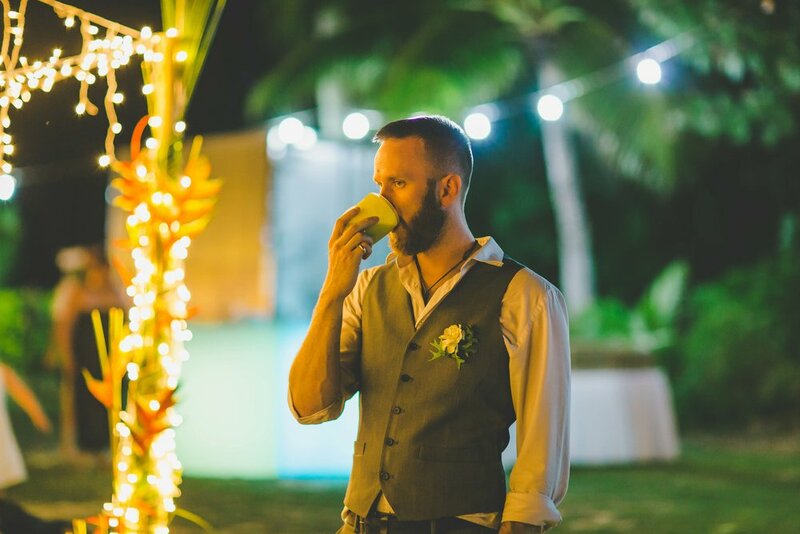 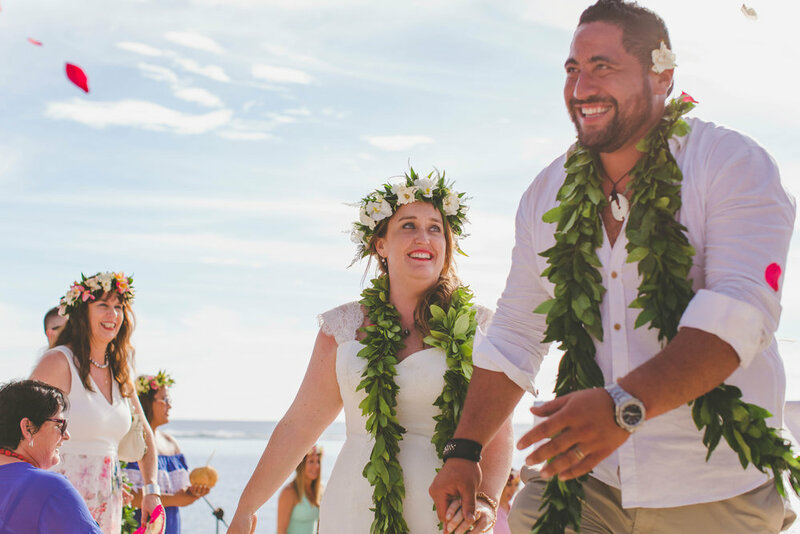 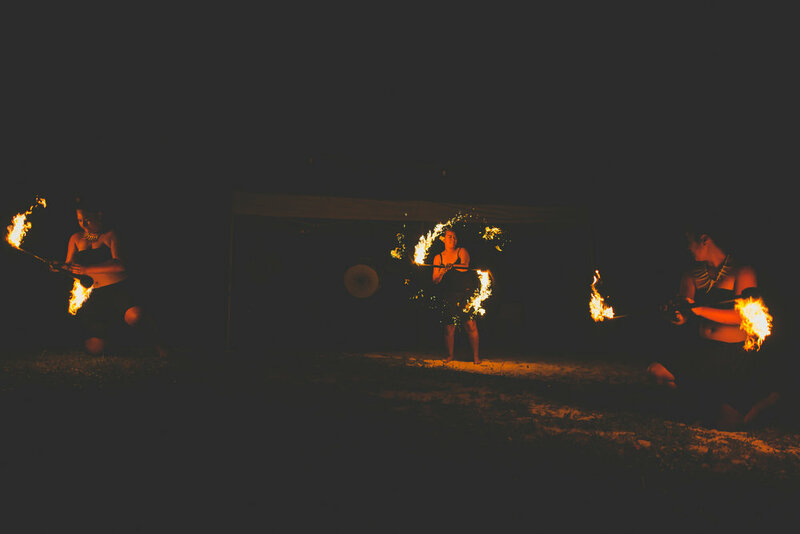 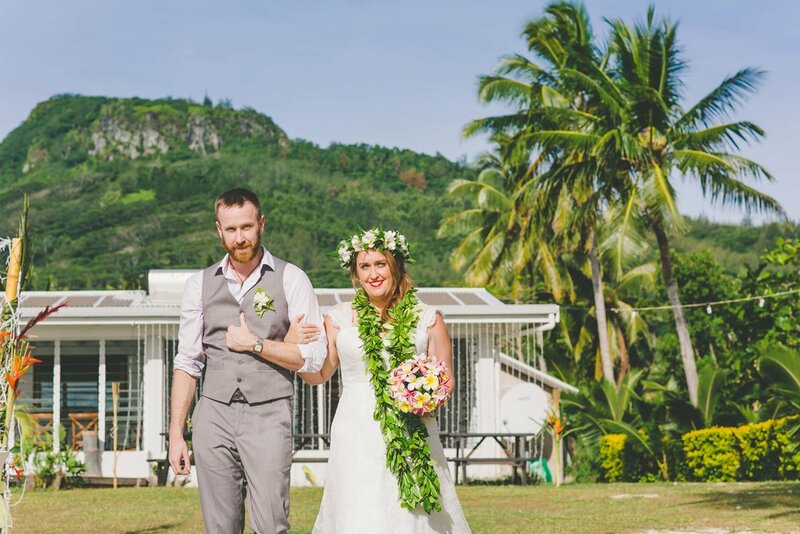 Our ceremony and reception took place at Sunset Quay, a gorgeous private beachfront home in Arorangi. 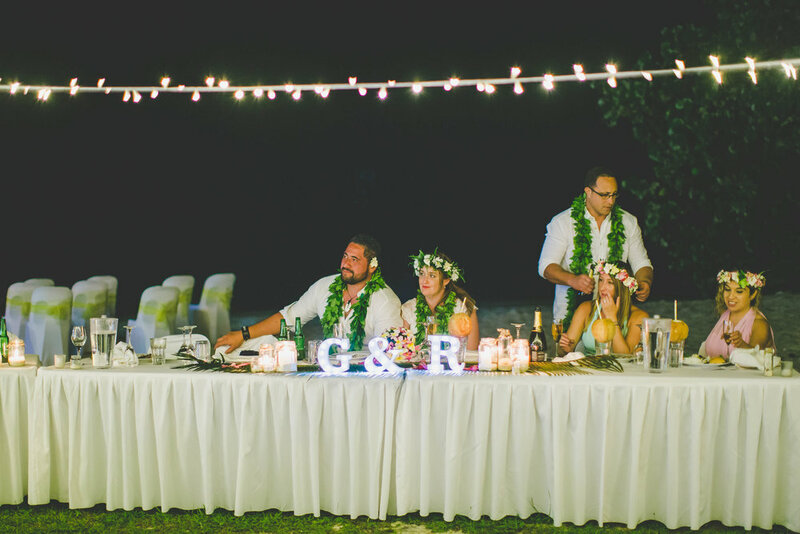 Decorated with love by friends and family; the setting was magical. 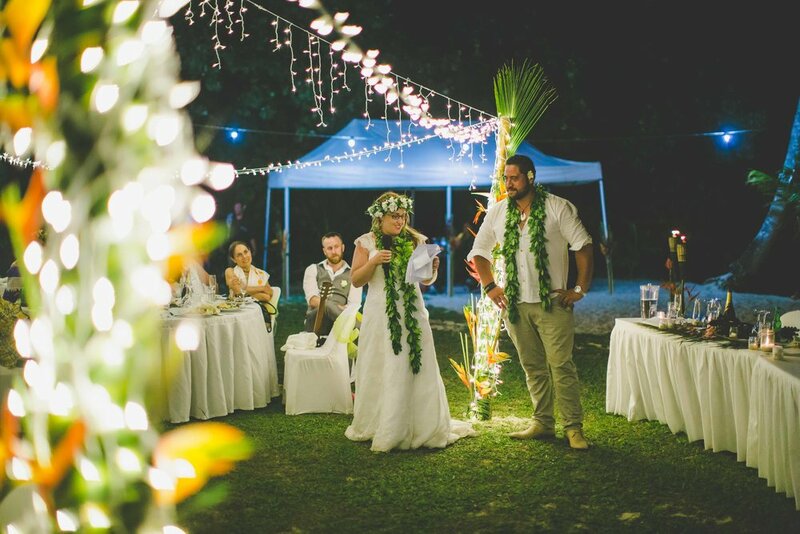 Tiki torches, fresh flowers, candles and a marquee made out of only fairy lights, I was blown away with how incredibly beautiful the whole setting was. 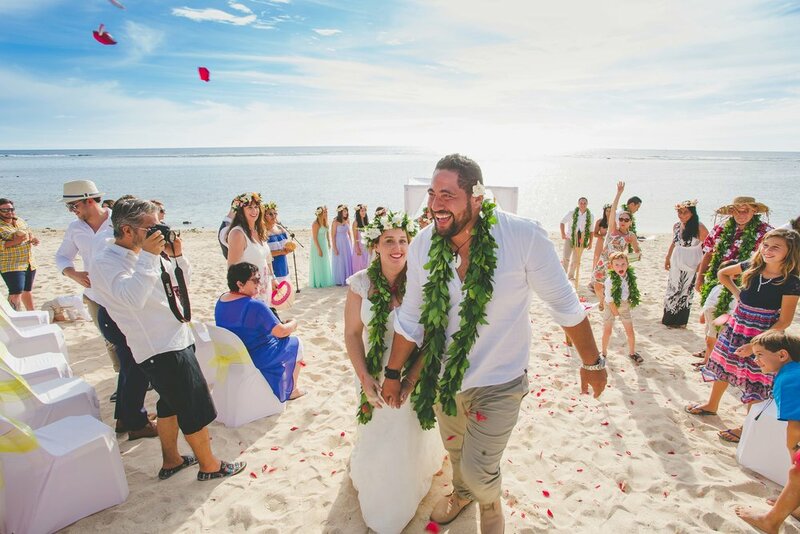 Walking down the aisle with views of the magnificent mountains one side, the sparkling lagoon the other and surrounded by all our favourite people beaming back at us, it was the perfect place to say ‘I do’.